For Christmas this year, both my husband and I received Amazon gift cards from his parents. 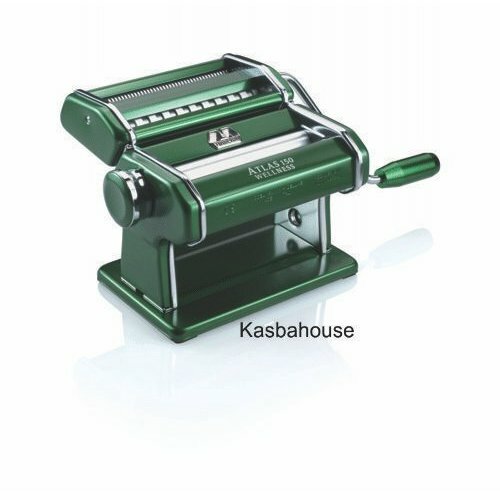 This is our favorite gift to receive for two reasons: Amazon sells books, which we are shamelessly addicted to, and they also sell all manner of interesting things like Bento boxes (which are awesome for packing lunches), household gadgets, random items of clothing, and...pasta machines. After perusing the offerings separately, we decided to pool our gift cards and buy a pasta machine. Our family happens to be huge fans of pasta...all kinds of pasta...and hubby and I like cooking. It was delivered today, so of course we had to try it out. On the first pass through the rollers, the dough will tear and have holes and will generally look completely ruined. Do not despair! Fold the dough over and send it through again. And again. And again. And again. Eventually, the dough will smooth out and as you decrease the distance between the rollers and increase the pressure on the dough, it will show it's hidden strength, becoming so strong that on the thinnest setting it will stretch until it is nearly transparent and still not break or tear. So many times, the pressures and stress of life have stretched me thin, tearing holes in my life. Financial problems, medical issues, family trouble - all of them have, at one time or another, ripped huge gaping holes in the life I thought we were making. It seemed that as soon as we had things patched up, we'd go through the ringer again and new holes would show up. Patch those, and...you guessed it...back through the ringer again. I can't tell you how many times we went through the ringer, its rollers squeezing us and pressuring us. Eventually, we realized that each pass through the ringer got a little easier. The rips and tears and holes got smaller and were easier to patch. All that squeezing, all that pressure, all that stress and trouble, made us stronger, more flexible. We don't tear now, we stretch. Things might get thin enough to see through, but we won't break. So, give us a little squeeze, love. How about you? Is life sending you through the ringer? Feeling stretched thin? I'm not sure if this new stretching is going to rip me apart or give me new strength. I'm teaching again, and Rhiannan is going into daycare! A new schedule for both of us, a new sleep routine for both of us, but hopefully I'll have more time for my own writing! Lots of squeezing and stretching! It was always hard for me to go back to living on someone else's schedule when I went back to work. I betting on new strength! Plus, I'll be Rhiannan is going to LOVE daycare!